The first of two books, which are the only guides to cover walking in and around Scotland's countryside parks. 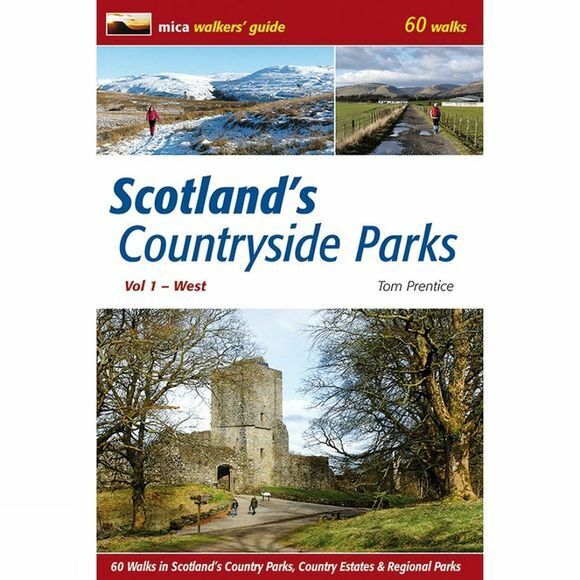 Volume 1: West describes sixty varied walks of two to seven miles in countryside parks mostly accessible by public transport and close to urban centres such as Glasgow, Cumbernauld, East Kilbride, Hamilton, Motherwell, Airdrie, Paisley, Greenock, Ayr, Kilmarnock, Dumfries and Stirling. Among the parks included in this guide are Pollok, Dams to Darnley, Calderglen, Chatelherault, Strathclyde, Drumpellier, Cathkin Braes, Gleniffer Braes, Finlaystone, Clyde Muirshiel, Kelburn Castle, Castle Semple, Dean Castle, Eglinton Castle, Culzean Castle, Brodick Castle, Balloch Castle, Mugdock, Balloch Castle, Palacerigg, Plean, Gartmorn Dam, Drumlanrig Castle and Threave Estate. Many of the country parks, country estates and regional parks covered in the book have other visitor attractions including castles, stately homes, gardens, art work collections, museums, galleries, shops and cafes. Some have adventure playgrounds as well as sporting opportunities such as golf, mountain biking, orienteering, sailing and canoeing. The book contains detailed notes on the parks and their facilities, including weblinks and public transport options for visitors. This is an invaluable guide that will appeal to a wide range of walkers, from those looking for family outings to casual visitors and tourists, as well as others interested in exploring their local environment and people seeking evening or weekend walks close to home.